Darjeeling | Small Farmers. Big Change. When Equal Exchange pioneered Fair Trade coffee in 1986, the founders were told they were crazy: how could they create a viable business model while simultaneously helping small farmers gain access to the market; pay them an above-market price; educate consumers about the source of their coffee; and connect producers and consumers in relationships based on respect and integrity? Two decades later, there is no question that the founders’ idealistic vision has radically transformed the coffee industry. While Fair Trade may not yet be a household term, the concept has entered the mainstream coffee market. Over 400 new Fair Trade coffee roasters have sprung up across the country and a number of larger companies are dedicating a portion of their coffee purchases to Fair Trade; all of which comes from small farmer co-ops. Consumers are increasingly choosing to buy coffee sourced from fair trade co-ops and the producer members of those co-ops are, in general, doing far better than their non-Fair Trade counterparts. Skip ahead 23 years and let’s take a look at the tea industry. By far, the vast majority of tea found on grocery shelves comes from large-scale plantations. Even 98% of tea that is labeled “Fair Trade” is sourced from plantations, one of the last vestiges of the colonial system. The certifiers claim that there is not enough small farmer tea to create a viable supply chain; that plantation tea is the only way to offer consumers a Fair Trade tea. However, while it is true that in some cases, workers have more participation in certain decisions than do those working on non-fair trade plantations, by only working with large estate tea, the Fair Trade model focuses far too much on supply and not nearly enough on Big Change. Transformation of the tea industry is both possible and long overdue. Due to the feudal nature of plantations, workers are often trapped in a system of dependency. In many cases, workers receive their housing, schooling and medical care from the estate. This means that if a worker loses his/her job, or if the plantation is abandoned, thousands of workers and their families are left without any form of income or services. In fact, in many regions, economic, political and cultural realities are causing this system, frozen in a bygone era, to crumble on its own. Tea workers, however, can’t afford to wait for slow change and committed fair traders and activists need to take action now to create a new model based on human rights and economic justice. We think the time for change is now. Our tea partners – in India, Sri Lanka, and South Africa – share this conviction. On a recent trip to Darjeeling, India, we visited our partners, Tea Promoters of India (TPI) and saw an array of exciting projects that are part of their vision of a transformed tea industry where the farmers are empowered, making decisions, taking risks, building their own businesses and improving their lives and communities. Sanjukta Vikas, a dairy co-operative comprised of 450 small farmers, also exports high quality, organic Fair Trade tea with the technical assistance and training of a local non-governmental organization, and the processing and marketing assistance of TPI. Walking through the community felt like that mythical Shangri-la of the movies. The village was clean and well-maintained, water flowed in abundance; the brightly-painted homes were surrounded by sweet smelling flower gardens, terraced hills, and shaded farms planted with oranges, bananas, onions, garlic, ginger, and turmeric. Colorful Buddhist flags were strung across the trees in front of a handful of houses; the co-operative itself is also home to Christians and Hindus. We visited farms and spoke with many farmers. The commitment they have made to bio-dynamics, organic farming, and permaculture was clear. We were shown how materials are recycled and reused; nothing is wasted. Another constant was the sense of pride and self-assurance the farmers displayed which contrasted sharply to other places we’ve visited. Owning their land and having options affords farmers a stronger sense of investment and control over their business. The Potong Tea Garden, established over 100 years ago by the British, is the story of a plantation repeatedly abandoned, taken over, mismanaged, and abandoned again, until 2005 when the 350 farmers decided to take control, and with the support of TPI, run the estate themselves. 2500 people depend on the plantation for their livelihoods, shelter, medical needs and educational services. After the government had taken over the plantation and grossly mismanaged it, Potong was auctioned to a Kolkata company in 2005. But the company was unfamiliar with the tea industry and suffered huge losses. So the owners sought out TPI and asked if they would be interested in running the estate. Representatives of TPI approached the workers. They explained the situation and proposed a solution to keep the estate in operation: the workers take over management – and 51% ownership. TPI would purchase 25% of the remaining shares and provide the technical assistance and market support. Like Sanjukta Vikas, the farmers could process their tea at TPI’s facilities. It wasn’t easy for Equal Exchange’s founders to challenge an entire coffee industry, especially one so rooted in economic, political, and historic power. But through the co-operative’s success, the organization has demonstrated that consumers are a “sleeping giant”: once “awakened” and shown a path grounded in fairness, respect, and mutual dignity, people will act on their values, aim high, and purchase ethically. Many will go beyond consumption and also advocate for necessary systemic changes. We believe there is a path toward a small farmer tea model like the ones we saw at Sanjukta Vikas and the Potong Tea Garden: one which paves the way for small farmers to have greater access to the market, affording them more economic power, stronger control, better lives, and healthier communities. There are already producer groups and alternative trade organizations working toward this vision. We are convinced that U.S. consumers, armed with information and knowledge, and given a real choice, will walk alongside us as we turn our vision into reality. There is no reason to accept anything less. On the steep hillsides of Mineral Springs, a member the Sanjukta Vikas Cooperative prepares a meal over a fire. Vegetables and greens bubble away in a cast iron pot and tendrils of steam are sent skyward to mingle with the mist that hangs heavy in the air over Darjeeling. It looks delicious and smells tempting but my colleagues and I will never taste it. This meal is for the cows. These cows are more than cows. By producing dung (for fertilizer), fermented urine (a natural pesticide), and milk (for, well, milk) the cows become partners in the endeavors of the people of Mineral Springs to live a biologically diverse, sustainable, and rewarding life. These cows deserve a nice hot meal. As we walked through the family farms in Mineral Springs, we witnessed countless reiterations of the many types of partnerships necessary in making this cooperative so successful. Binita Rai, a mother of two, is a teacher at the school in the cooperative as well as a farmer herself. She also serves as a member of the Welfare Committee which plays a part in deciding where fair trade premiums will be allocated. Mineral Springs has no processing factory. Tea that is plucked there is processed at another nearby garden whose manager regularly visits the community to engage the members in discussions on issues such as quality and logistics. The Sanjukta Vikas Cooperative also partners with local non-governmental organizations (NGOs) to educate its members on biodiversity, composting and other sustainable agricultural practices. 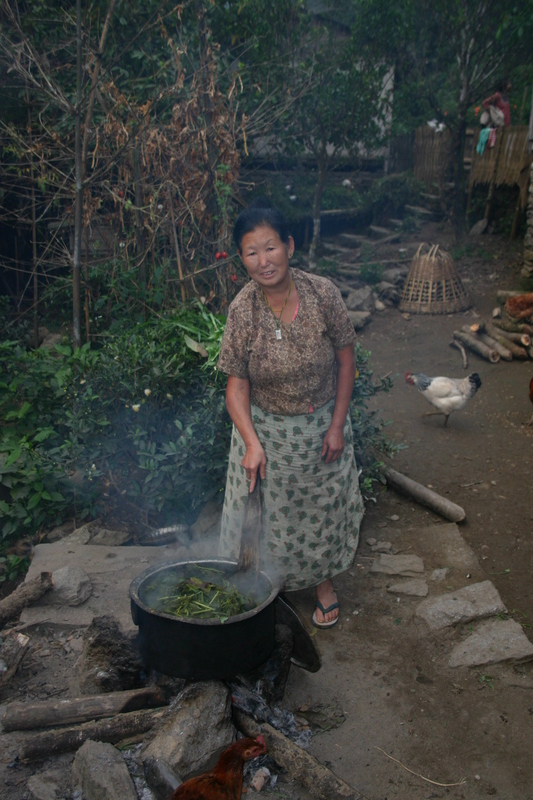 Closer to home, partnerships have the potential to create real movement around small farmer teas. Natural foods co-ops who are committed to educating consumers about small farmer issues concerning coffee and other crops have an opportunity to further connect consumers and producers within the realm of tea by partnering with Equal Exchange and promoting a small farmer model. By offering teas from the shining example of food sovereignty that is Sanjukta Vikas as well as from other, newer worker-owned tea gardens that are struggling to establish themselves, food co-ops give consumers the opportunity to partner with producers in the struggle for food security and ownership models. These partnerships may seem like rhetorical, abstract lines that dimly connect one end of the world to the other, and I only have the following personal account to offer as argument: I have seen a tea farmer hold a box of finished product and watched the realization creep over his face that THIS is what you’re buying, what he’s selling, and what the face of his life is to you. He knows that you are connected directly to him. For me, it was a perfect example of the connections made from a hundred partnerships across a thousand miles all culminating in the hands of a farmer who laughed at the fact that we had put the tea in a bag (it’s all strainers and loose leaf in Darjeeling). That is very real – more real than I, in my four years of being a worker-owner at Equal Exchange, ever thought it was possible for anything to be. 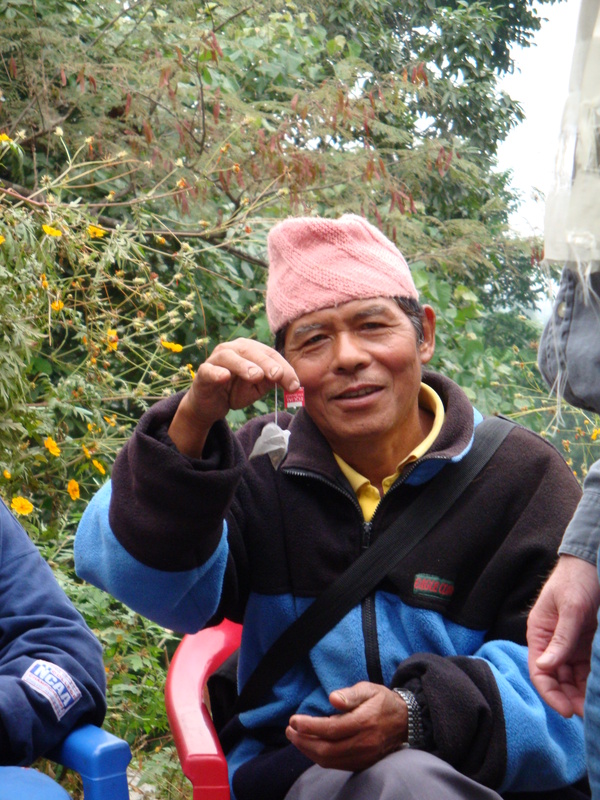 We recently returned from a trip to Darjeeling where we were visiting our partners, Tea Promotors of India. TPI is a progressive Indian company with a deep committment to transform the tea industry (still heavily seeped in its colonial legacy) into an empowerment model for small farmers. Over the next few weeks, I’ll be writing a lot about our trip and this vision. How viable is a small farmer tea model in India and elsewhere? How likely is it that U.S. consumers will care about supporting a vision of small farmer tea? If we believe that there is a difference between working long days on someone else’s plantation and working co-operatively with other small farmers to own, manage, and run your own tea business, what can we do to support this vision? The following photos were taken at the Singell Tea Garden in Darjeeling, India. Most of the photos are of tea pluckers. Some of them are of visitors; excited to see, listen, learn, and work alongside our partners. We hope this is just the beginning of a new phase where consumers in the U.S. think more deeply about where their tea comes from, who is growing it, and under what conditions.